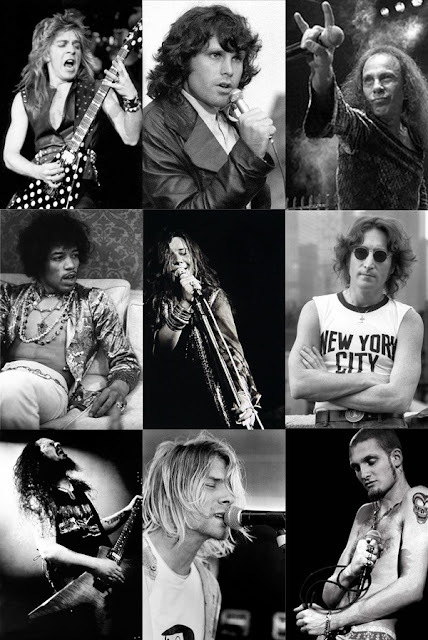 Jimi Hendrix, Janis Joplin, John Lennon, Dimebag Darrell, Kurt Cobain and Layne Staley. This year when the Sketchbook Project 2012 sign-ups started, rock and roll fans were mourning the deaths of two very influential musicians - Kurt Cobain (Nirvana) and Layne Staley (Alice in Chains). I have always been a huge music fan. I believe that music can express what you need to say when you can't seem to find the words. It can express your inner most thoughts and feelings - show your pain or your happiness. It's art in musical form. Scott and I were listening to the song "Nutshell" by Alice in Chains and talking about how this is Layne Staley in his purest form. Pouring his heart out and begging for help. (He struggled most of his life with drug addiction). Scott had also been learning to play the song on guitar. When I looked at the choice of sketchbook themes this year - I spotted a couple I liked right away. I continued down the list, laughing at some and contemplating others...then I read Forever in a Nutshell. It almost seems like the theme was pre-chosen for me this year. I couldn't pass up an opportunity to do this theme and dedicate a page to Layne. Scott agreed. Some musicians/artists shine so bright while they are here, that they burn out too quick and are gone in the blink of an eye. This was the cause with Randy, Jimi, Janis, Kurt and Layne. Some last longer, but are taken away from us by cancer (in the case of Dio) or by gun-wielding fanatics (Lennon and Dimebag). Several of them found it hard to escape their pasts and their addictions. All of the musicians above left a legacy of music that will forever be cherished - Forever in a Nutshell. Maybe I'll chose to give them a little tribute in my sketchbook also. After all, they deserve it. Do yourself a favor...take a moment to revisit the music you grew up on (or even the music your parents grew up on). Think about the musicians and the impact they've had on your life. I dont think I could of said it better Dana. I swear I almost got a tear reading about Randy and Layne knowing what I know of them and the legacies they have left behind.